How will you fund your strategic plan? 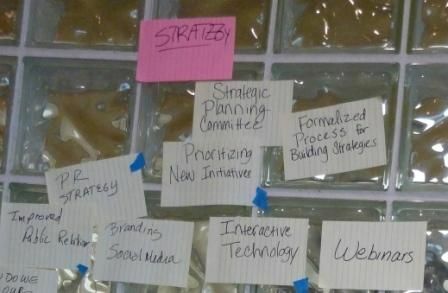 Strategic planning is the process that drives the work of many nonprofit organizations and institutions. It takes different forms depending on the culture and policies of the nonprofit. Some complete the process at a retreat, others hire a facilitator to work with a committee of the board, still others hire a firm to survey best practices and emerging trends amongst competitors and collaborators. The outcome – a strategic plan – will drive operations and decision making over a multi-year period. If fundraising planning is not integrated into the strategic plan, you may find out later that the plan’s underlying assumptions don’t materialize. Assuming a consistent (or increasing) level of funding without planning for how those funds will be raised, can put the organization itself in jeopardy. Creating operating budgets without a market-based assessment of whether or not the required income can be generated can also put your nonprofit at risk. If the strategic planning committee envisions a major fundraising campaign as part of the organization’s future be sure to poll your board members to learn whether or not they would be willing to give an increased amount of their time, money and resources to that campaign. If your board isn’t willing to lead and give, including such a campaign in your strategic plan may not make sense. Unless your nonprofit is funded through a well managed, unrestricted endowment, someone within the organization will ultimately be charged with raising the funds required to bring the strategic plan to life. The extent to which he or she can raise the required funds is often impacted by the extent to which the nonprofit’s strategic direction aligns with funding priorities of local and national foundations, corporations or individuals who have the financial capacity to make major gifts. One way to integrate fundraising planning into the strategic planning process is to invite input from select donors and funders. Ask program officers and corporate leaders about the vision, strategic directions, goals and objectives of the foundations and businesses they represent. Your CEO and fundraising staff can also provide the strategic planning team with information they have gained over the years regarding giving trends and requirements. When you know your nonprofit will need to invest time and money to grow a new pool of donors and funders you can budget and schedule growth to align with realistic revenue projections. Incorporating this into your strategic plan can help set realistic expectations. This entry was posted in FUNdraising Good Times and tagged budget, fundraising, revenue projections, strategic planning. Bookmark the permalink.